This first book to cover neural development, neuronal survival and function on the genetic level outlines promising approaches for novel therapeutic strategies in fighting neurodegenerative disorders, such as Alzheimer's disease. 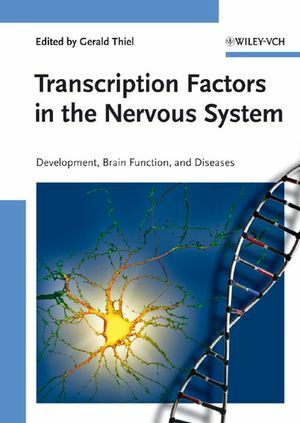 Focusing on transcription factors, the text is clearly divided into three sections devoted to transcriptional control of neural development, brain function and transcriptional dysregulation induced neurological diseases. With a chapter written by Nobel laureate Eric Kandel, this is essential reading for neurobiologists, geneticists, biochemists, cell biologists, neurochemists and molecular biologists. Since 1997 Gerald Thiel has been professor for Medical Biochemistry and Molecular Biology at the University of the Saarland, Germany. In 1987 he started his career as a post-doc at The Rockefeller University, New York, in the lab of the 2000 Nobel Prize Laureate Paul Greengard. At the same time he was visiting fellow at the Howard Hughes Medical Institute, University of Texas. In 1991 and 1992 he worked as an assistant professor for Molecular and Cellular Neuroscience at The Rockefeller University, and from 1992 to 1997 he was head of lab at the Institute for Genetics, University of Cologne, Germany. His current research interests are the regulation of neuronal gene transcription, signal transduction in the nervous system and the regulation of proliferation and programmed cell death in the nervous system. Master Control Regulator or Modular Function?